Morse Code had always been an obstacle to me in the 80’s when I was trying to pass the Amateur Radio exams. I tried the audio tapes and listening to W1AW and even bought a Commodore 64 just so I could use a morse code app which was only available on this platform. And well none of it worked, for various reasons. I memorized the tapes, not random enough and at the time living in an apartment reception of W1AW was dodgy at best, and the Commodore app was less than great. I decided that I could write an application which would help me and help others, and MorseTutor was born. The first fully working version was released in 1987 and I wrote the ham magazines and posted the executable to the online dial up services of the time Compuserve and Genie. Pretty soon the downloads started and the letters and SASE envelopes started to flow. And for the next seven years I actively made changes and shipped floppy to anyone who asked. Operating systems changed and machines became faster and some started to have troubles with overflow errors on application start up due to techniques I used back before the operating system provided timers with resolution sufficient to time the individual dots and dashes. I was able to make a few changes to extend the life for a while longer, but around the mid 90’s I was not longer able to maintain a development environment and MorseTutor 3.1d was the end of the road. However all is not lost, while morse code is no longer a requirement in order to obtain a license the skill does remain relevant. And for those who wish to hearken back to the days of old and run MorseTutor again. Or for those who are new to code and are looking for a suitable tutor. With the aide of a dos emulator MorseTutor can be run again. 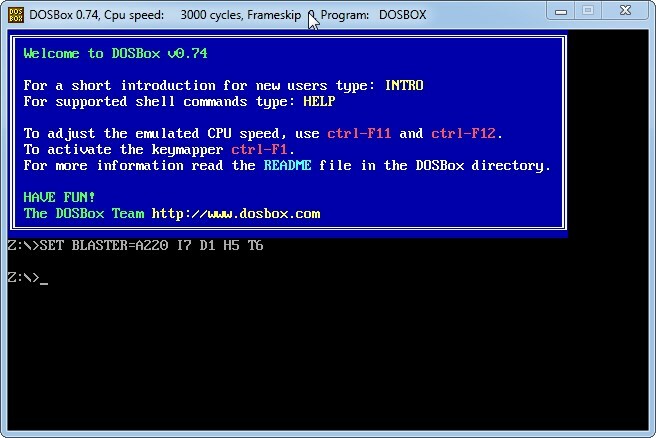 DOSBox is available at www.dosbox.com will permit MorseTutor to run on the fastest of machines. The screenshots below were taken on a Windows 7 systems with a i4770k running at 3.9Ghz. After you mount the drive containing MorseTutor into DOSBox execute morse and it should startup and begin to calibrate the internal timer.